In political consulting, we frequently use social pressure, communication designed to compel the recipient to comply with a given social norm in order to avoid the risk of humiliation. Most often, we use the technique in advocacy or issue-based campaigns rather than candidate campaigns. The AAPC even has several categories of Pollie Awards dedicated to practitioners who excel in the use of social pressure. So how do we employ social pressure? An example of social pressure direct mail. Note the gentle nudges, thanking them for voting and promising to followup after the upcoming election. For example, consultants who work in direct mail will frequently develop social pressure mail designed to increase voter turnout for their clients. We will identify registered voters who align with our client’s issue but are infrequent participants in the voting process. Once that target universe is identified, we will use direct mail to alert the voter to the fact their participation is public record, show their voting history and inform them their participation (or lack thereof) in an upcoming election will be monitored. In some instances, we ratchet up the pressure by telling the targeted voter not only will we be watching to see if they cast a ballot, but we’re also going to tell their neighbors whether or not they vote. 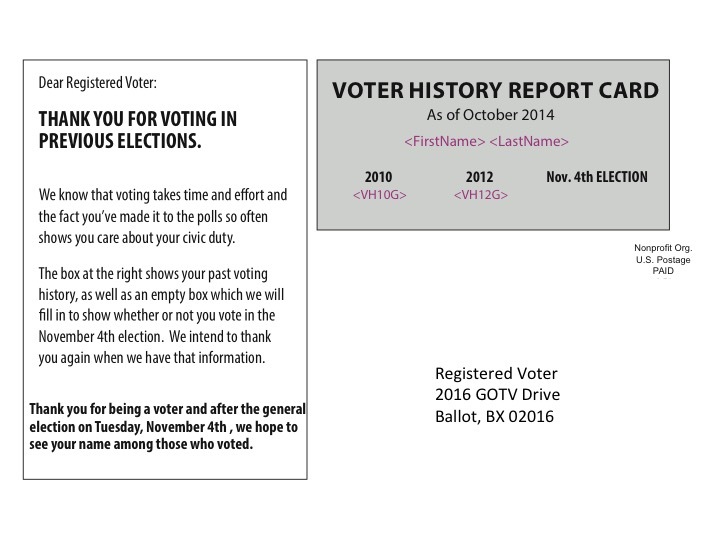 Using direct mail with voting history as social pressure has been studied extensively in scholarly research as well. Political scientists Donald Green, Alan Gerber and Christopher Larimer conducted the seminal academic study of social pressure in cooperation with political consultant Mark Grebner, who developed the concept of social pressure in political campaigns. In the experiment, they sent direct mail to 80,000 households leading up to the 2006 Michigan primary. Each household was sent one of four mailings applying various levels of pressure. The researchers discovered that as the pressure increased, so did the turnout of the group, up to 8% higher for the group who received the mail with the most pressure applied. Consultants and campaign managers can make good use of the information presented by scholars and capitalize on the desire of voters to be accepted by incorporating social pressure into their campaign plans when appropriate to do so. There are two instances when the use of social pressure is clearly indicated. First, in the vein of tradition, if you expect turnout to be low, it’s reasonable to use social pressure to increase voter participation. Second, if public opinion is sufficiently on your side, it is not unreasonable to capitalize on that support, creating a social norm with which voters would feel compelled to comply. In other words, use social pressure to pile people on your bandwagon. Once the decision has been made to include social pressure in a campaign, there are three key steps to ensuring success. Similarly to any other campaign communication, you have to target the right audience. In the case of social pressure communication, this typically means targeting voters with an inconsistent voting history but the propensity to support your client’s cause. Targeting the correct voters requires some solid data work by the client ahead of time in order to ensure you’re not driving turnout among voters of the opposing viewpoint. Nothing can undermine the hard work you put into a social pressure campaign or threaten the credibility of your client than incorrect data. Put another way, you should never send a mail piece to a voter claiming they didn’t vote in an election if they did indeed vote in that election. The voter will know the truth and your incorrect data will prove detrimental to your efforts. After all, the voter may think, if you got the previous information wrong, how could I believe that you’ll correctly follow up on whether or not I vote this time? Someone, whether you or the client, needs to take time and verify the information you’re planning to use. Taking a random sampling of the data, call the secretary of state or county clerk and check the records. Indeed, this requires some legwork, but it is essential. As much as people yearn for acceptance, they have an equal repulsion for being told what to do. As such, consultants must strike a balance between pressure and pushback, or reactance. Reactance is “the tendency for people to push back in response to a forceful message designed to change their behavior” by ignoring the message, performing the opposite of the behavior advocated or attacking the source of the message. An appropriate level of pressure can be determined by looking at the target audience. For example, the higher a voter’s propensity to support your client or their cause, the more you can increase the pressure on that voter without losing their support. In the end, although social pressure is a useful tool for consultants, it is not necessarily appropriate for every campaign, particularly candidate campaigns. Strategists, consultants and managers have to look at the dynamics of the race and determine if the use of social pressure fits in the campaign plan and is worth the inevitable fallout. If it is, go for it. If not, it’s best to leave social pressure alone, lest you run the risk of doing more harm than good for your cause.